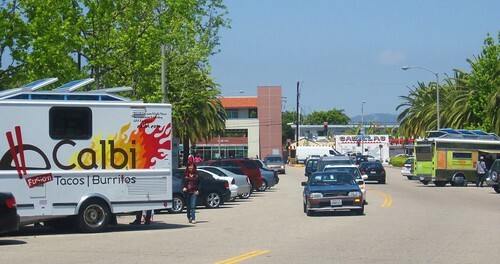 The city of Santa Monica is still harassing food trucks by arbitrarily enforcing an ordinance that requires food trucks to move every half an hour. Parking enforcement swarmed down to Ocean Park and 31st St today where Nom Nom Truck, Calbi, and Dim Sum where serving a lunch crowd to inform them that they must move their trucks every half an hour or be fined. How far must they move you ask? Oh, just thirty feet. This isn’t about public safety. It’s about harassment. Having these trucks move every 30 minutes where they have to back up and avoid traffic and pedestrians is actually a threat to public safety. It sounds like someone at City Hall has it out for the food truck scene. They put the kibosh on the food truck lot at 14th and Santa Monica Blvd and the city of Santa Monica has been harassing food trucks with this idiotic law. 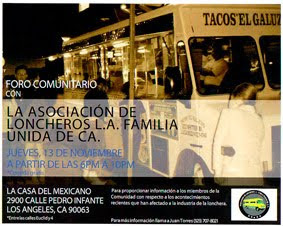 Santa Monica, you’ve licensed these food trucks to do business in your city. Now leave them alone. 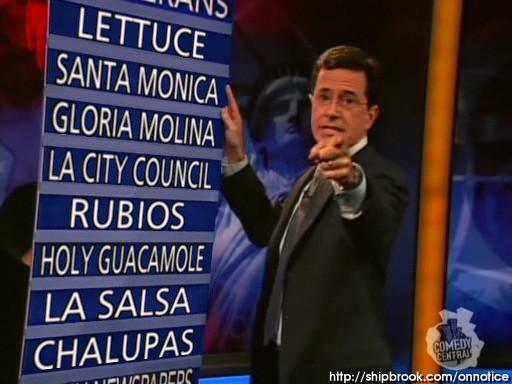 This gives me a good reason to pull out the Colbert on notice generator. I’m taking Long Beach off the board( I forget why I put them up there anyway) and adding Santa Monica. Santa Monica! You’re on notice! i haven't stopped by your blog in a while and was sad to see the long hiatus. but it's good to see that you're back. awesomeness! I'm launching a food truck on Tuesday 4/20. I live in Santa Monica and am in the process of getting my Santa Monica business license. After reading this, I will probably forgo the porcess and just stay out of Santa Monica. Sad that a resident has to take his truck out of his own city. Shame on the City of Santa Monica.